The Canon EF 300mm f/4L IS USM Lens is another excellent lens in the Canon L Series. While it has enough focal length to feel long, this very-well-built lens remains relatively small and light. Image quality from the 300 f/4L IS lens is excellent. The 300 f/4L IS is a relatively light 2.6 lb (1,190g) and is very well built. This weight ranks the 300 f/4 IS at slightly less than the Canon EF 70-200mm f/2.8L IS USM Lens. The 300 f/4 is relatively thin and long - 3.5" x 8.7" (90.0mm x 221.0mm) - and feels this way. This size handles very well and is very nice to carry. With Canon's Ring USM (Ultrasonic Motor), the 300 f/4 IS focuses accurately very fast. I find focus accuracy to be very good - especially when shooting sports in AI Servo mode. While the AF motor is quiet, expect a mild clunking sound at each AF movement start and stop. FTM (Full Time Manual) focusing is enabled. The 300 f/4 is one of two current Canon lenses that have a built-in retractable lens hood (the Canon EF 400mm f/5.6L USM Lens is the other). I like the convenience of quickly sliding the hood out/in for use/storage - or to gain access to a filter. A 77mm filter to be more specific - the same size as many of Canon's other L-Series lenses. Aside from the hood, this lens does not extend with focusing. The filter does not rotate. The 300 f/4L IS is a partially weather sealed lens. A lens mount gasket is not present, but the switches and focusing ring have moderate dust and moisture resistance. A front filter should be used for sealing purposes. The Canon EF 300mm f/4L IS USM Lens is perhaps best known for its sharpness. Sharpness wide open at f/4.0 is very good with slight improvement visible at f/5.6. Corner sharpness is very good even when used on a full frame body. Barely-noticeable full frame corner vignetting can be seen at f/4 on a full-frame body - it is mostly a non-factor and disappears once stopped down slightly. Color and contrast are good. CA (Chromatic Aberration) is very well controlled. Very slight pincushion distortion is present - but you will likely not notice it. Flare is not a problem. Separating the subject from the background is easy with this lens thanks to the long focal length and a relatively wide f/4 aperture. Longer f/4 lenses are available, but all of them come at a much higher price. Put a little distance between the 300 f/4L IS lens' subject and the background, dial in a wide aperture setting and watch the subject emerge from beautiful, smoothly blurred background. The quality of the OOF (out of focus) areas is enhanced by an 8-blade aperture. One of my favorite features of the300 f/4L IS lens is Image Stabilization (IS). IS allows the Canon 300 IS to be handheld at a much lower than normal shutter speed - 2 stops lower. This does not help stop a moving subject, but it does amazing things to stop a photographer's motion. Keep in mind that the version of IS on this lens needs to be turned off when tripod-mounted. Not doing so may cause the image stabilizer to act erratically. Also note that this IS implementation is not loud, but is more audible than some of the latest implementations. In the above comparison picture from left to right are the Canon 24-70mm f/2.8L USM Lens, Canon EF 180mm f/3.5L USM Lens, Canon EF 70-200mm f/2.8L IS USM Lens and Canon EF 300mm f/4.0L IS USM Lens. The 180 and 70-200 have Wimberley P20 Lens Plates mounted on them. The Canon EF 300 f/4 IS L Lens (above left) is noticeably smaller than the Canon EF 300 f/2.8 IS L Lens (above right). Both lenses have Wimberley Lens Plates attached to their tripod collars. The 300 f/2.8 is a far more expensive lens, but it delivers the ultimate in features and image quality. The Canon EF 300mm f/4L IS USM Lens is great for nature and wildlife photography. When paired with the Canon Extender EF 1.4x, this lens becomes a 420mm f/5.6 IS lens. On a 1.6x FOVCF body, this focal length will even reach into bird photography range. The 1.4x introduces some CA and barrel distortion. Wide open sharpness is also degraded somewhat - especially in full frame corners. Stopping down to f.8 results in a very sharp image - even in full frame corners. Remember that AF is slower when using extenders. The 300 f/4 IS is also compatible with the Canon Extender EF 2x II, but not everyone will be satisfied with the results of this combination - And non-1-Series Canon DSLR bodies do not autofocus with this combination. Sports photography is another good use for this lens. Great AF and optical performance combined with a relatively long focal length and a reasonably wide aperture deliver what is needed to capture outdoor sports. Like many other lenses, this lens works well for portraits and landscape photos - 300mm compresses these subjects relative to other commonly-used-for-these-subjects focal lengths. 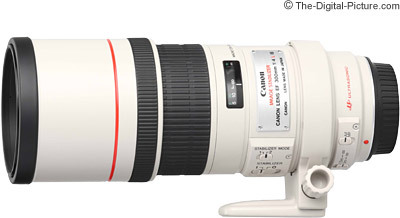 The Canon EF 300mm f/4L IS USM Lens focuses down to a relatively close 4.9' (1.5m) for a .24x maximum magnification. This is not a 1:1 macro lens, but .24x is a nice magnification. Plants, flowers and butterflies make great subjects for this lens. Extension tubes extend the maximum magnification a small amount - to .30x and .37x for 12mm and 25mm tubes respectively. Better magnification will be delivered by the Canon 500D Close-up Lens. Those considering the purchase or rental of the 300 f/4L IS will usually consider several other lenses as well. 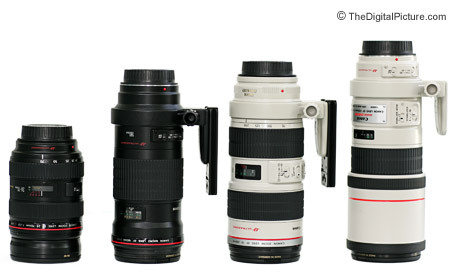 These include the Canon EF 70-200mm f/2.8L IS USM Lens (along with a Canon Extender EF 1.4x), Canon EF 100-400mm f/4.5-5.6L IS USM Lens and Canon EF 400mm f/5.6L USM Lens. Or the newer Canon EF 70-300mm f/4-5.6L USM Lens. The Canon EF 70-200mm f/2.8L IS USM Lens in combination with the Canon Extender EF 1.4x delivers an extremely versatile package of quality and features, but the 300 f/4 IS has better image quality (sharpness - especially in the corners - and contrast) at f/4 than the 70-200 does at 280mm f/4. Stopping down to f/5.6 greatly improves the combo's image quality but this costs 1 stop of light (allows 1/2 as much light to reach the sensor during the same amount of time). The 70-200 f/2.8L IS is weather sealed - the 300 f/4L IS is not. If you plan to primarily use 280mm or 300mm, the 300 f/4 IS gives you a lighter and less expensive package with better image quality. If you need 280mm only infrequently, then consider the 70-200 + 1.4 - or the Canon 100-400 L.
The Canon EF 100-400mm f/4.5-5.6L IS USM Lens is another highly recommended lens that competently covers the 300mm focal length - and much more. At 300mm, the Canon EF 300mm f/4L IS USM Lens has slightly better sharpness (especially in the corners), slightly less pincushion distortion, slightly higher maximum magnification and is lighter, less expensive - and possibly most significantly - is 1 stop faster. However, if you can live with 300mm f/5.6, the 100-400 L adds the great versatility of a wide focal length zoom range that includes 400mm. If 400mm is your goal, the 100-400 will give you better results than the 300 f/4 and 1.4x combo. 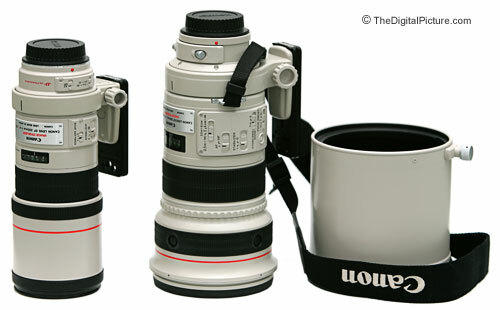 If 400mm is your goal, the Canon EF 400mm f/5.6L USM Lens is another option you should consider. This lens shares very similar build design with the Canon EF 300mm f/4L IS USM Lens including the slide-out hood. By far (in my opinion of course) the biggest detraction from the 400 f/5.6 is the lack of IS. Handholding this focal length requires a relatively fast shutter speed - which requires light. The biggest advantage is that 400mm is native - which delivers better image quality including less CA, better contrast and less barrel distortion. AF remains at its fastest with no extender installed. The 400 f/5.6's minimum focus distance is a relatively long 11.5' (3.5m) giving it 1/2 as much native magnification (.12x) as the 300 f/4 IS without the 1.4x attached. The 300 f/4 IS ships with a nice padded Canon LZ1128 case and the tripod collar shown in the pics above. Overall, this lens a a very good value. The Canon EF 300mm f/4L IS USM Lens delivers great image quality and physical features for a relatively low price. If you need only 300mm (and 420mm available with the 1.4x) and f/4 is a wide enough aperture for you, look no farther.